At each level, the English Reading and Spelling for the Spanish Speaker workbook comes first. After students have completed this workbook, they can do the reading comprehension, writing composition and vocabulary workbooks at that level. At Fisher Hill’s website www.Fisher-Hill.com, click on Teacher Resources on the top tool bar on the home page. Then click on Reading and Spelling. Scroll down to Scope and Sequence and click on it. 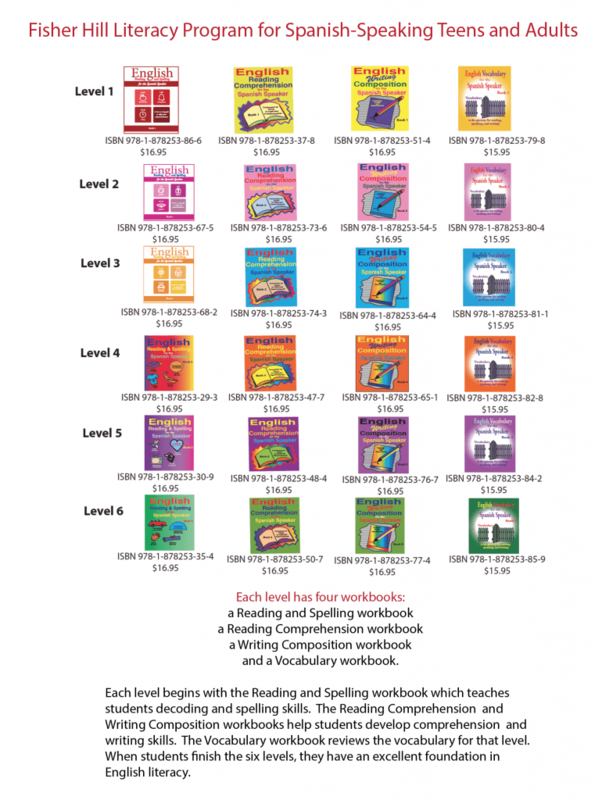 The Scope and Sequence gives activities to do with the reading and spelling workbooks and also presents the sounds introduced and practiced in each workbook. The sounds are the ones that will be practice at each level of the program. If you have difficulty finding the Scope and Sequence for the English reading and spelling workbooks, you can email your questions to therst@icould.com and someone will respond within 24 hours or call us and someone will walk you through the website. Below is the Scope and Sequence for the English Reading and Spelling for the Spanish Speaker workbooks. Before beginning English Reading and Spelling for the Spanish Speaker Book 1, practice the consonant sounds below with your students. Many of the consonant sounds are the same in English as in Spanish. The letters: q, w, x and y have been left off this list because they are introduced and practiced in English Reading and Spelling for the Spanish Speaker Book 1. Bb says /b/ as in boy. Cc says /c/ as in cat. Dd says /d/ as in dog. Ff says /f/ as in fun. Gg says /g/ as in goat. Hh says /h/ as in house. Jj says /j/ as in jump. Kk says /k/ as in kite. Ll says /l/ as in lion. Mm says/m/ as in mat. Nn says/ n/ as in no. Pp says /p/ as in pet. Rr says /r/ as in run. Ss says /s/ as in sun. Tt says /t/ as in top. Vv says /v/ as in van. Zz says /z/ as in zoo. To help your students obtain automaticity with these sounds, you can use flash cards, graphic organizers or smart boards. Students need to know that both upper and lower case letters make the same sound. This is a graphic organizer for the sound of letter s. Students can work together to make graphic organizers for each of the consonants listed above. The teacher can use a smart board for the students to practice their letter sounds or students can write their own letters to practice the letter sounds. From left to right, students read the sounds. On the following pages are the sounds, words, prefixes, suffixes, roots, and spelling rules that are presented in each of the six workbooks. On pages 31, 62, 93 and 124 are Spelling Checks. The teacher dictates the words to the students who write the words and then read the words back to the teacher. 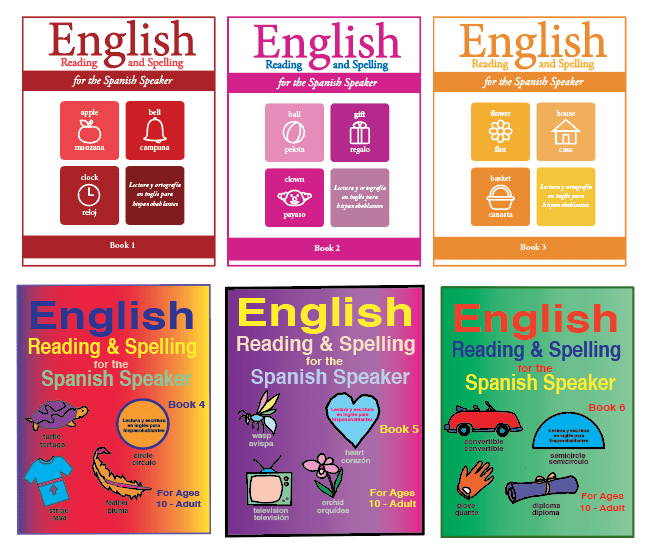 Visit our website at www.Fisher-Hill.com to view our English Reading and Spelling for the Spanish Speaker workbooks which are the first books to use at each level. There are sample lessons from each workbook that can be downloaded.